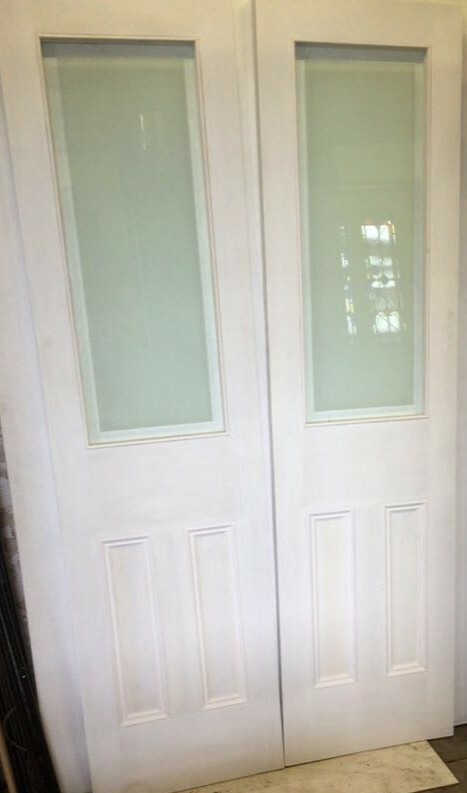 This Victorian style door is sanded and ready for hanging or painting. Glass is lamented safety glass it is reproduction glass. If you need bigger it is an extra £72 per every 2″ on the width. 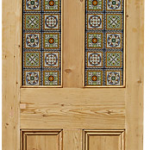 Made-To-Measure - Louis Stained Glass Pine Door (Best Selling, comes with LEADED GLASS and is totally BESPOKE) (Stock No MTMLSGD) The Louis Door can be altered to any size up to maximum 32 x 81. 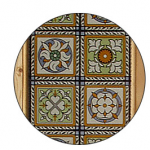 It is available in thicknesses of 40mm, 45mm.Included in the offer price is a light sand and traditional stained glass as seen.For exterior use we can fully sand and finish in Sadolin Light Oak , or primed in Grey Primer, ready for painting, this is an additional charge.The leaded glass is included. Glass colours can be changed, and style of glass can be changed, for an additional charge. 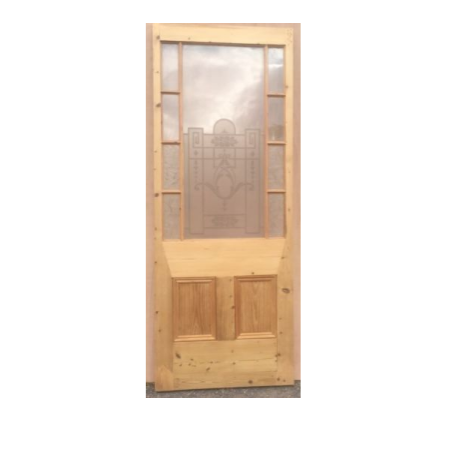 MADE-TO-MEASURE We will make this door to any size you require up to size listed for the price shown. 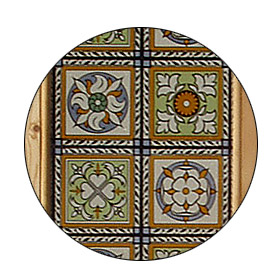 If you need bigger it is an extra £72 per every 2" on the width. Letterboxes and Doctors knockers also available in brass or chrome, security locks can also be supplied (please contact us for details). 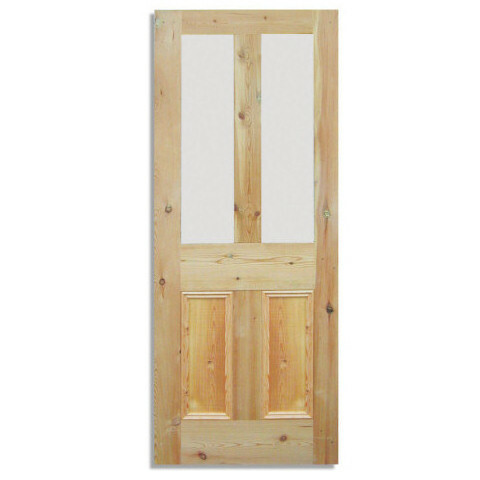 All doors subject to stock availability, plus delivery charge, please contact us for details. Made with reclaimed wood by professional carpenter by scarfing in on an original door. 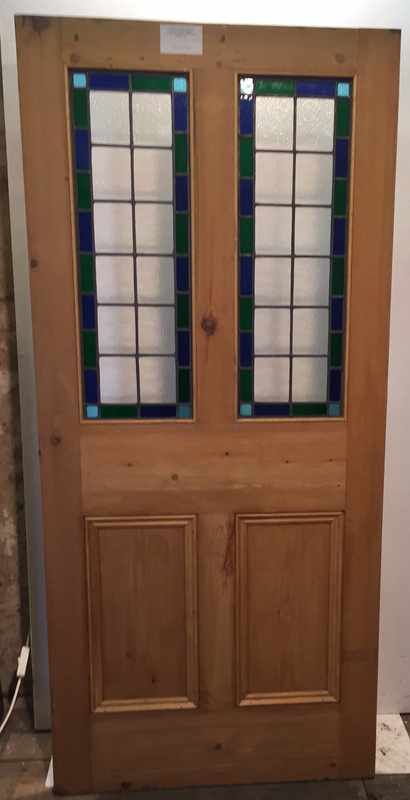 Truly stunning and the glass had been cut and fitted professionally by a stained glass practitioner with many years experience in the traditional way. 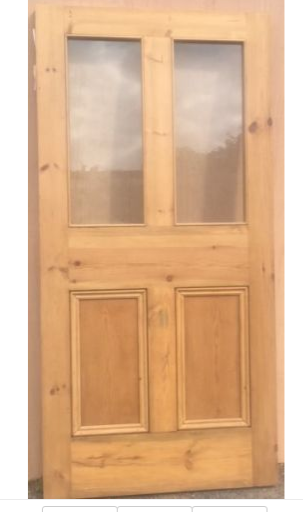 This door can be made to most sizes. The outside has been primed and is ready for painting, the inside has been waxed. Flat panels on the outside to help keep the weather out and 4 panes of glass in to the top of the door allow lots of light to come through. 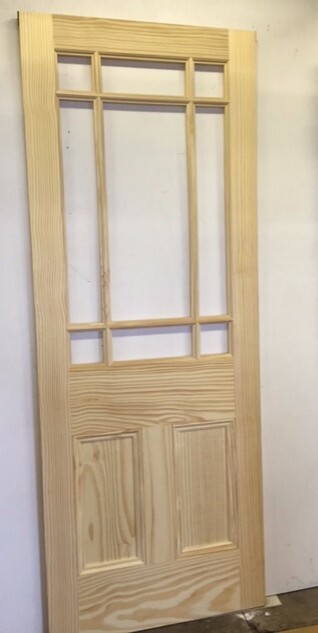 This is an original pitch pine internal door with gun holster shoulders on the mid rail. This has original leaded textured stained glass (with no colour). 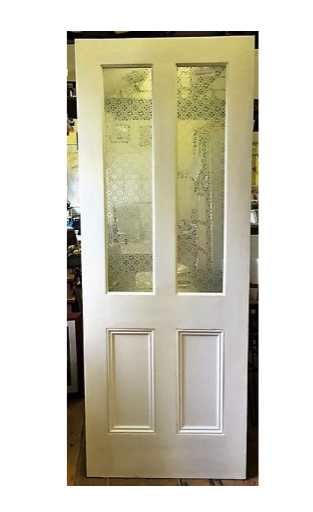 Four Panel Victorian Style Door - Hand Made using Reclaimed Pine by our Master Craftsmen - Solid Pine - you simply cannot find them in the shops like this! Made in our workshops - using methods we have been using over 30 years - viewing welcome. Primed and ready to be painted and hung. THE GLASS AROUND THE EDGE IS CLEAR TOUGHENED SAFETY GLASS . THE DOOR HAS BEEN ADDED TO ON TO THE BOTTOM BY SCARFING IN RECLAIMED TIMBER BY US HERE IN OUR WORK SHOPS .